The reason why we see the structure we do is that scientists act like a sieve and focus only on those phenomena that have structure and are predictable. They do not take into account all phenomena; rather, they select those phenomena they can deal with…Scientists have classified the general textures and heights of different types of clouds, but, in general, are not at all interested in the exact shape of a cloud. Although the shape is a physical phenomenon, scientists don’t even attempt to study it. Science does not study all physical phenomena. Rather, science studies predictable physical phenomena. It is almost a tautology: science predicts predictable phenomena. Yanofsky groups these criteria under the general heading “symmetry,” and he concludes: “The physicist must be a sieve and study those phenomena that possess symmetry and allow those that do not possess symmetry to slip through her fingers.” I won’t get into the rest of his argument, which draws an ingenious analogy from mathematics, except to say that it’s worth reading in its entirety. But I think his thesis is sound, and it ties into many issues that I’ve discussed here before, particularly about the uncomfortable status of the social sciences. Robert Heinlein, in his “If This Goes On—,” presents a civilization in which mob psychology and propaganda have become sciences. They aren’t, yet…Psychology isn’t a science, so long as a trained psychologist does—and must—say “there’s no telling how an individual man will react to a given stimulus.” Properly developed, psychology could determine that. As an editor, Campbell began to impose psychological and sociological elements onto stories where they didn’t always fit, much as he would gratuitously insert references to uranium-235 during World War II. He irritated Isaac Asimov, for instance, by asking him to add a section to the story “Homo Sol” about “certain distinctions between the emotional reactions of Africans and Asians as compared with those of Americans and Europeans.” Asimov saw this as an early sign of Campbell’s racial views, and perhaps it was, but it pointed just as convincingly to his interest in mass psychology. 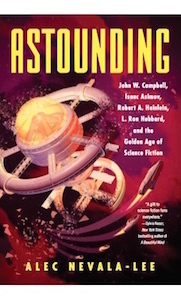 The Astounding Science Fiction of the past year has brought forth a new type of story, best described, perhaps, as “sociological” science fiction. The spaceships…are still present, but more emphasis has been placed on the one item which will have more to do with shaping the future than anything else, that strange race of bipeds known as man…Both Asimov [in “Homo Sol”] and Heinlein [in “If This Goes On—”] treat psychology as an exact science, usable in formulas, certain in results. I feel called upon to protest. Its very nature prevents psychology from achieving the exactness of mathematics…The moment men stop varying and the psychologist can say definitely that all men are alike psychologically, progress stops and the world becomes a very boring Utopia. Campbell responded: “Psychology could improve a lot, though, without becoming dangerously oppressive!” Just two months later, in a letter in the January 1941 issue, Asimov referred to the prospect of “mathematical psychology”: “If we can understand Einstein and Hitler down to the mathematical whys and wherefores, we might try to boost along a few Einsteins and cut down on a few Hitlers, and progress might really get going.” Campbell replied much as before: “Psychology isn’t an exact science—but it can be.” Implicit in the whole discussion was the question of whether psychology could be tackled using the same hard-headed engineering approach that had worked for the genre before. And as I’ve written elsewhere, the evolution of Campbellian science fiction is largely one of writers who were so good at lecturing us about engineering that we barely even noticed when they moved on to sociology. But what interests me now is the form it took in Astounding, which looks a lot like the sieve that Yanofsky describes. Campbell may have hoped that psychology would learn how to predict “how an individual man will react to a given stimulus,” but he seems to have sensed that this wouldn’t be credible or interesting in fiction. Instead, he turned to two subsets of psychology that were more suited to the narrative tools at his disposal. One was the treatment of simplified forms of human personality—say, for instance, in a robot. The other was the treatment of large masses of individuals. Crucially, neither was necessarily more possible than predicting the behavior of individuals, but they had the advantage that they could be more plausibly treated in fiction. Campbell’s preferred instrument at the time was Asimov, who was reliable, willing to take instruction, and geographically close enough to talk over ideas in person. As a result, Asimov’s most famous stories can be read as a series of experiments to see how the social sciences could be legitimately explored by the genre. The Three Laws of Robotics, which Campbell was the first to explicitly formulate, are really a simplified model of human behavior: Campbell later wrote that they were essentially “the basic desires of a small child, with the exception that the motivation of desire for love has been properly omitted.” At the other end of the spectrum, psychohistory looks for laws that can be applied on a mass scale, and it’s central not only to the Foundation series but even to “Nightfall,” with its theme of the cyclical rise and fall of civilizations. In science, you could draw a parallel to artificial intelligence and macroeconomics, which represent two extremes at which qualities of symmetry and predicability seem to enter the realm of psychology. In between, there’s a vast terrain of human experience that Campbell was never quite able to tackle, and that impulse ended up being channeled into dianetics. But much as science can be defined as everything that makes it through the sieve of symmetry, Campbell had a sieve of his own, and the result was the science fiction of the golden age. People between the ages of twenty and thirty read a good deal. After thirty their reading drops off and by forty is confined to each person’s special subject, newspapers, and magazines; so that the most important part of one’s audience, and that which should be mainly written for, consists of specialists and people between twenty and thirty.